With the start of Wimbledon today, Britons can shift their focus away from England’s swift departure from the World Cup and onto another great summer sporting event. Andy Murray, the first British man to win Wimbledon in 77 years, has already won his first match and a great majority of those celebrating will engage in one of the tournament’s most time-honored traditions: eating strawberries and cream. Food vendors began hawking strawberries there in 1953, and some enterprising ones starting pouring on the cream in 1970, never looking back. Today strawberries occupy a place of honor at the tournament perhaps only overshadowed by whichever members of the Windsor family decide to show up that day. To well-dressed British tennis fans (the organizers instituted a dress code last year—leave your flip-flops at home unless you want to be considered “riff-raff”) strawberries and cream are what the mint julep is to big-hatted horse aficionados in Kentucky. Spectators will eat 61,729 pounds of strawberries over the next two weeks in London. That’s 4,400 pounds of strawberries a day, all picked the night before and brought in fresh every morning at 5:30. To go with that, they will take down 1,850 gallons of cream. The best news is that the All England Club is keeping its prices down. A pint of berries will set you back only £2.5 ($4.25)—you can barely get a bag of dusty peanuts at a baseball game for that much. 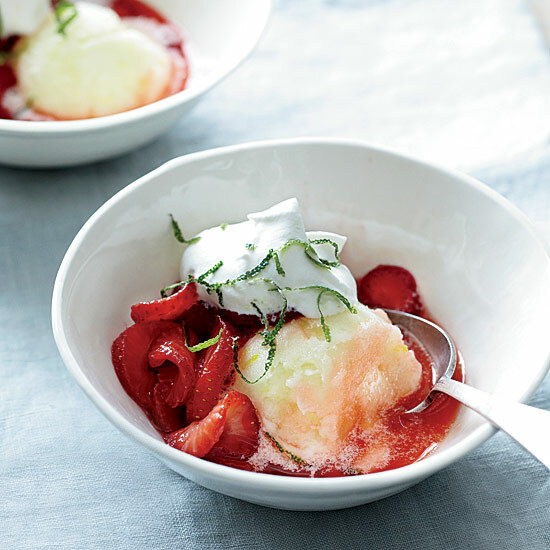 If you want a Wimbledon experience at home, these honey-lime strawberries with whipped cream are a more advanced riff on the simple British dessert. (More American, too, since we like our cream whipped.) Serve them if you’re watching the matches this week, and see if you get more than a polite tennis clap.